So, I’m beginning the work now on figuring out some household rituals in a Kemetic framework, since if I’m going to go back to that calendar, then this just seems like the most useful thing to do. Only, Kemetics don’t seem to do household rites, or it’s not generally been emphasised very much. But, idk, man. If we can recreate the temple stuff, we should do the household stuff, too. It’s part of what I really love about Greek and Roman polytheisms, but it’s so absent in Kemetic stuff. That said, if anyone has any rites, or knows of any rituals that exist, I’d love to see them, if only for my own curiosity and inspiration. So. That being said, I am going to write some of my own that fit my practice and what it’s evolving into. I have already bodged together a Sixth Day Rite (which I apparently have never posted here wtf) but I also want to write some rituals for the first and last days of the month, as well as the half month, too. I might also bodge together a full moon rite, but idk. I don’t know if I’ll end up doing that, but I might if Khonsu keeps gently poking at me, like He is right now. What a shy, adorable god He is. I decided to name my first day of the month rite House of Nut, House of Aset, House of Renenutet, to mirror the last day (House of Ra, House of Heru, House of Wesir), and because idk. It fits well with my practice and gods and how I like to work. I always like to throw in some zep tepi references whenever I can, that seems to work well for me. I like that sense of opening the month like you’d open the year, to bring that repetition into the mix. It’s not a historical title for the day, but that’s what I’m running with. I wnt to keep them short and simple, though. And I’ve changed around my shrines so I can do household rites at an actual shrine and not work from a shelf above my bed (which is not particularly practical). But that’s okay. I’ve done some other minor tweaks and changes to the other shrines, because I am constantly fiddling with them. And I am having a srs ‘gods with black skin’ aesthetic thing going on right now (there are many reasons for this) so that is also affecting which statues I use. Anyway. That’s what I’m working on now. I’ll be sure to post the rites here when they’re done, so you can all play around with them, too. GFDI it is April, not March. I am terrible at this tonight. My brain is overtired, and I need to go to bed soon. Anyway. Noumenia is done. Offered rum, and made an extra libation to Hermes. My mother is travelling back from overseas in a few hours, and I’ve had a little safe travel spell going since she left. So I finished it off tonight, and hopefully, Hermes will take care of them all and she’ll be back home safely. Also, this desk makes a great altar, ngl. There’s enough space for everything, and for a small omen at the bottom. There’s room to place the incense next to the window, so it can not be always in my face. Should have thought of that before I burnt four tiny sticks of incense on top of a jar right next to me. I am terrible sometimes. I am probably going to give myself a migraine over this, I can feel it coming on. If I could get frankincense, myrrh, and rosemary in a Japanese incense form, I wouldn’t need to worry about this, but oh well. Anyway. We’ve had storms tonight, and my cat has not appreciated this. She was crying outside the parents’ bedroom door halfway through the ritual, so I had to take a moment to corral her into my room. Because of the weather, I’ll pour out the offering tomorrow. And now I am going to post this and head to bed because I am tired af. But noumenia is done for another month, and I feel good. 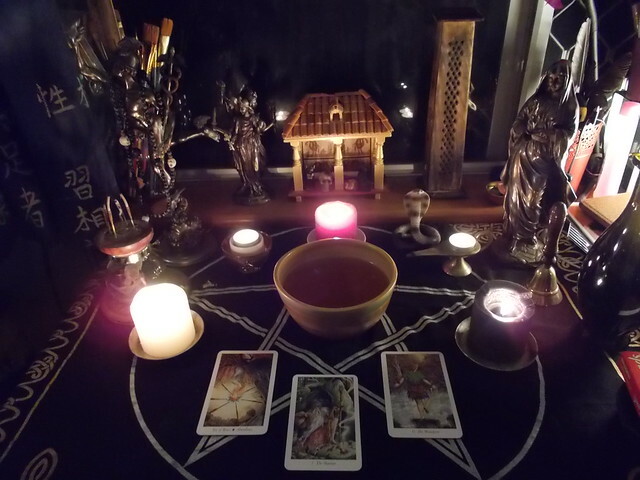 Shrine set up for Hekate’s deipnon. Sans offerings and such as this was taken after I’d disposed of everything because I forgot to photograph it before then. Black bowl on the left was for libations, the orange/gold bowl was for the deipnon itself. So I finally got over that mental thing in my head that was all, ‘how can you do deipnon without a crossroad wtf’, and have again tried to follow the advice of both Isis and Hekate, and that is to just turn up at shrine and do ritual and be there with them, and stop worrying about the details. So that is what I did. I decided to dispose of my deipnon into the compost bin outside, because recycling bad stuff into compost to feed the garden seems appropriate for deipnon. So I did that instead of leaving it at a crossroad. Which solves my ‘I don’t want to leave food out in a public place’ issues that had stopped me doing deipnon before.